The dromedary or Arabian camel (Camelus dromedarius) is a large even-toed ungulate with one hump on its back. Its native range is unclear, but it was probably the Arabian Peninsula. The domesticated form occurs widely in North Africa and the Middle East; the world's only population of dromedaries exhibiting wild behaviour is an introduced feral population in Australia. The dromedary camel is one of the best-known members of the camel family. Other members of the camel family include the llama and the alpaca in South America. The Dromedary has one hump on its back, in contrast to the Bactrian camel which has two. Dromedaries were first domesticated in central or southern Arabia some thousands of years ago. Experts are divided regarding the date: some believe it was around 4000 BC, others as recently as 1400 BC. is one of the historical and traditional sports that is practiced by Arabs, especially Yemenis. The relationship between Camel and Arabs is more than that between an animal and jockey; it is, rather a stronger friendship. For Arabs, the camel is a symbol of the strength that overcomes all hard challenges of the harsh desert environment, and for that, the camel is known in Arabic as the ship of the desert. Camels can travel vast distances in desert, drink from waterholes far more bitter or saline for others and eat almost anything, regardless of how tough or how thorny they are. For Bedouins, the camel can be considered as a member of the family that transport them, and feed them with milk, meat and hair. It is always said that Bedouins bones and body are very strong because they drink camel's milk every day. Although camel racing (Al-Hagen) is very old sport, the government started to take care of it officially only in March 1987 when the first camel racing in the town of Al-Husineah, located at Al-Hudaydah province, took place. Nevertheless, it is said that Al-Husineah Festival had been running for centuries. The main aim of this festival is to rebirth historical sports, such as; camel racing, horse racing, long distances races, high jump up over a row of camels. The latter sport is the most popular one where a number of camels are lined up and a sportsman runs and jumps high over them. At the famous sand dunes in Tottori 鳥取砂丘 we have some camels for the tourists.
. . . CLICK here for Japanese CAMEL Photos in Tottori sand dunes ! It is well known to scholars of Dutch knowledge that processed urine of a camel is a miracle medicine to cure a person in critical condition. If a child puts this picture up and always takes a look at it, it will help improve the condition of rashes and smallpox, and an evil being will disappear from the child's mind. Thunder monsters are so fearful of camels that a thunder will never hit where a camel is present. Therefore, the Dutch use a picture of a camel as a charm to protect them from thunders. 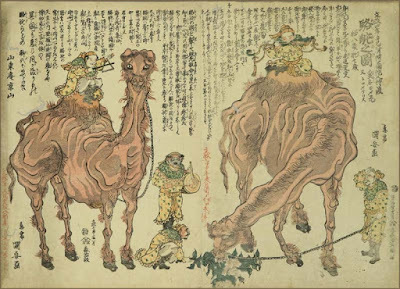 Camels were put up on display usually with Japanese people dressed in Chinese clothes or foreign clothes to create an exotic atmosphere. Whatever animal they were showing, it was important to create a certain foreign feeling for the show. Chinese and Western images were most preferred, but the word such as tenjiku (old term for India) and Saiho (it really means the western land, but also means the heaven in Buddhism) were also frequently used for these shows. Furthermore, the use of the names of various long-believed icons, such as Benten (the godess of fortune), Ten-nin (a heavenly being), Daikoku (the god of wealth), and Wagoshin (the god of conjugal harmony) enhanced the idea that these animals were indeed holy and would bring some lucks. In these animal show prints, besides the urine of camels, the excrement of elephants, feathers of cassowaries, and fur of donkeys were also mentioned as medicine and charms. Show proprietors may have encouraged these ideas to lure larger audiences. In 1821, a camel was brought by a Dutch ship and became a huge boom. ... It is said that this camel was exhibited in Ryogoku Hirokoji 両国広小路 in Edo and too many people gathered to see it. As indicated by comments such as "The feeling of touching the camel was like touching a carpet," some people went to touch it.
. Welcome to Edo 江戸 ! . is becoming a tourist attraction as well as an enjoyable part of life in Northern Kenya.
. . . Some photos are HERE ! Nairobi, where most of the Kenya haijin live, is south of the camel zone and, apart from the few camels that are based in the city as attractions for fairs and similar events, there are none here. 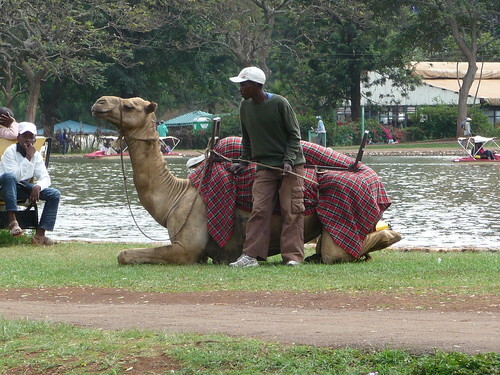 The camel was on its way to a fair, I am sure -- or to Uhuru Park, where children can try out camel rides on Sundays... It was the only occasion when I have seen a camel on Jogoo Road (one of the main roads in and out of the city centre). 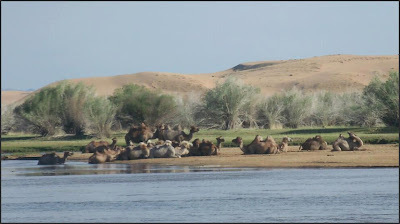 The wild two-humped Bactrian camel, camelus bactrianus ferus, is indigenous to Mongolia. It was domesticated at least three thousand years ago. 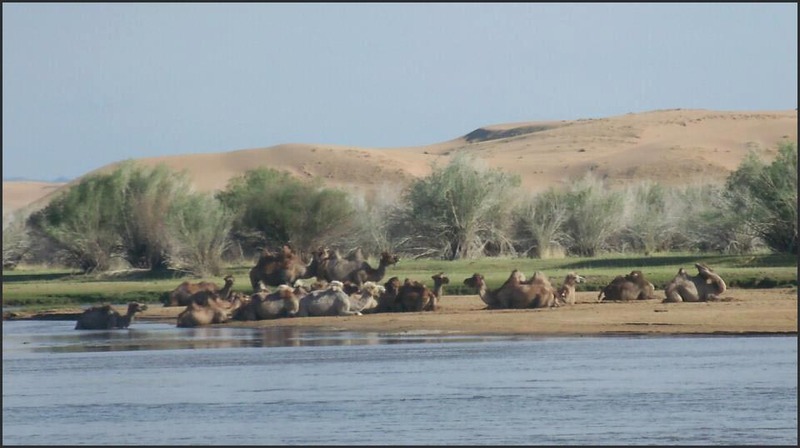 The camel is one of the tavunhorshoo,'five snouts,' the five domesticated animals of Mongolia on which the country's herding economy depends: horse, cow/yak, sheep, goat, and camel. 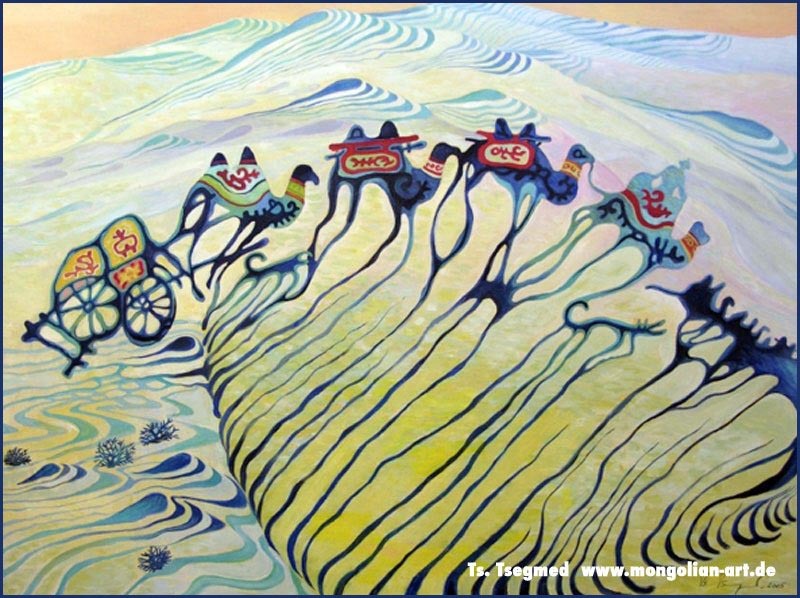 Camels are raised all over Mongolia, but are found particularly in the four Gobi aimags (provinces) in the south. ... Watering camels in the Gobi is hard work. floating in a mirage . . . 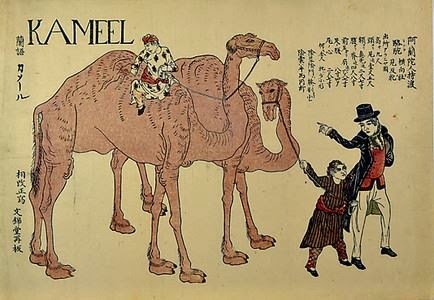 This is a song named "khuus" (хөөс) to calm a mother camel which lost its colt. Camel melts and sheds tears in the song. 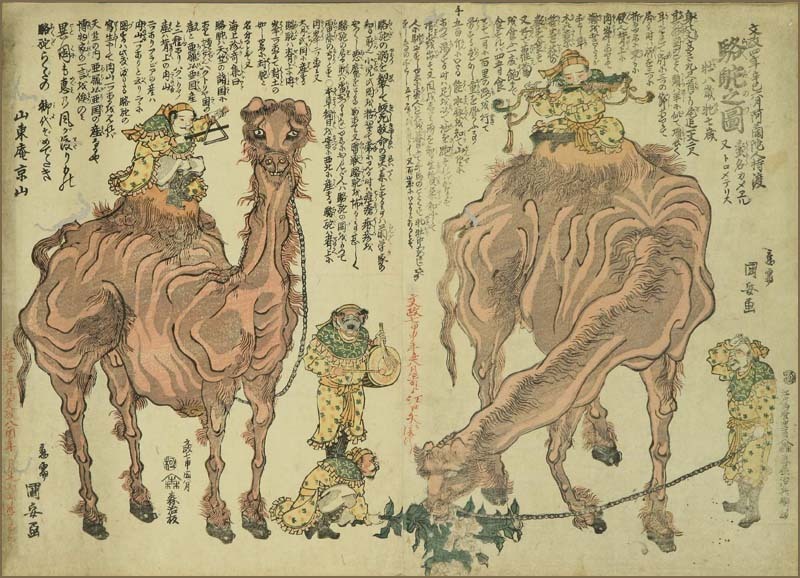 When camels are loaded with ger to be moved to another place, those who drive them say " huug huug" (хөөг хөөг) to encourage the camels. Also, saying huug huug helps establish a rhythm for the camels while they are traveling. 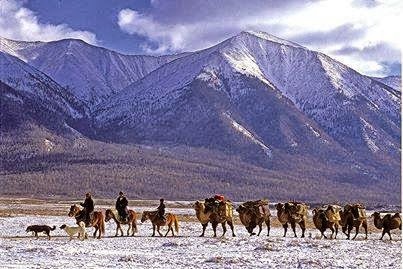 Mongolia has nomadic herding, always moving from place to place to find good pasture for animals. Herders still move by camels and oxcarts now in the countryside. Children are kept in the basket for collecting dung.